The Diablo/Trex co-branded blade will be offered in three sizes – 1", 10" and 7-1/4" – for use on hand-held, miter and table saws. This new saw blade series has a modified triple chip tooth grind design, Perma-SHIELD® non-stick coating, and specific TiCo™ Hi-Density carbide to deliver maximum performance. 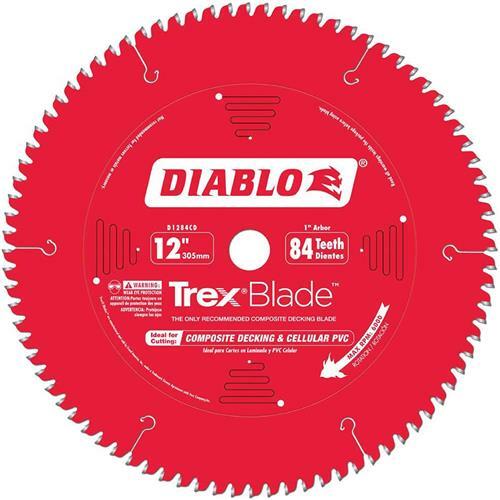 In addition, all Diablo/Trex saw blades have a super thin-kerf design which requires less cutting power, making them ideal for underpowered saws at the jobsite. In fact, Trex and Diablo have conducted extensive field testing among contractors at composite decking job sites to evaluate the performance of the new blade. The tests consistently showed that the blade offers more efficient and cleaner cuts, less "gumming" of blade teeth, and greater longevity when compared to standard saw blades currently on the market.